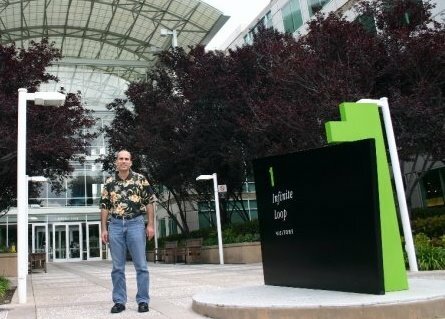 In the late 1990s, when I told people that I worked at Apple, it was like telling them that I worked at Atari or Commodore. "You don't hear much from Apple, anymore," someone once said to me. The funny part, when I started working there in 1998, was that I had no experience on a Mac. I only knew that Macs were easy to use. I was hired at a job conference in San Diego and, after I accepted the verbal offer, I confessed to my soon-to-be boss that I had never worked on a Mac. "Don't worry about that - we use Windows NT," he said. Seriously? I was about to go work for Apple on Windows?!? I shouldn't have been hired due to my lack of web/Java experience, but it was the Dot-com boom and Apple was hiring like Gang Busters. I didn't even know what my job position would be when I signed up, so I was wondering what I'd be working on that required me to relocate to the Washington DC area. All I knew is that it was an unbelievably exciting time to be working in high tech. It seemed like everyone was getting rich! It turns out that I was hired to be a WebObjects consulting engineer for the consulting division in the Apple Federal office (this office has since relocated to a different part of town). My first week at Apple, I was given a Toshiba Tecra and my job was to "build it from scratch" which meant installing Windows NT, WebObjects, and an Oracle database server. This was not an easy task - I had to hunt down lots of little things like network card, video, and printer drivers and then figure out which interrupts they needed to be configured to (if I recall correctly). But, before I did that, I had to use a floppy disk to install PKZIP so I could unzip files. Not fun at all. I felt so dumb that I'd be sure to ask different coworkers for help so that no one person could see my total ignorance. The reason we worked on Windows NT was because, the previous year, Apple had purchased NeXT for both their operating system (OpenStep) and web app server (WebObjects). At the time of the purchase OpenStep and WebObjects ran on Windows NT. Several years earlier, NeXT engineers had ported NeXT OS from their proprietary hardware over to Windows - a technique that would benefit Apple in 2005 when they seamlessly ported Mac OS X from the PowerPC to the Intel processor. Their secret was to develop against layers of abstraction rather than hard coding directly to low level hardware. For example, to get WebObjects, which was designed to run on UNIX with a Mach kernel, to run on Windows NT, they ported over a subset of the Mach kernel to sit between WebObjects and Windows. It ran as a Windows daemon to help WebObjects work with Windows. Apple's future was very precarious in the late 1990s. During my first few years, I kept wondering why I was purchasing Apple stock and not Microsoft's. The iPod, iPhone, and iPad weren't even a gleam in Steve Jobs's eye back then as he attempted to design four desktop and laptop computers for the consumer and professional markets. While a lot of my coworkers had jumped ship in the late 1990s I hesitantly decided to stick it out. I had seen a glimpse, through WebObjects and OpenStep, of what the future could be. Needless to say, it turned out much better than I could have imagined. Looking back, it seems that Apple was predestined to become what it has - but, living through it was a daily ritual of self-doubt. Nice introduction to your story! Look forward to reading more... hope you'll describe more about your work there, your reactions, whether you hung on to the stock (if so, you're probably now independently wealthy!) and so on. When you did leave, what made you leave? When did you first get a Mac? My first Mac was a strawberry iMac that I got at the end of 1998. I left Apple under good circumstances to take some time off and pursue my own projects.